TSplus Version 12 is now live and ready to run on your desktops, servers, and in the cloud! TSplus is thrilled to announce big changes for 2019. The team of expert developers, with input from users and administrators, have brought TSplus a new look and new features. A new administration tool with refined workflow makes management easier than ever before. Read further to discover some of the highlights of the newest version of TSplus. For the past few years, The development team at TSplus have been running a race for innovation. Looking back at 2018 shows just how quickly the software has evolved. TSplus has become the most secure and powerful alternative to Citrix, Ericom and Parallels 2X. The R&D investments are paying off. TSplus is a successful and reliable solution, gladly recommended by Network Administrators, IT resellers and Integrators all over the World. Last December, TSplus published a summary of the major changes brought to the Application over the past year (see the Press Release TSplus Smart and Powerful Web Application Delivery Solution). In 2018, TSplus’ developments focused on three key points: Mobility, Security and Scalability. Today the software can be easily used on any type of device, with a common user experience that makes the transition from one device to another consistent and reliable. It has passed several security audits and includes many options to lock down remote sessions and protect servers from multiple types of cyber threats. Last but not least, the Development Team has performed important work on TSplus’ Alternative Shell to maintain compatibility with future versions of Windows. In 2019, TSplus will continue to build on the successes of last year, with a renewed focus on quality and professionalism. TSplus version 12 is a major step in this direction. The interface of the Administration Tool has been completely redesigned to provide a remote desktop application that is comprehensive, simple, and clearly organized for easy management. IT Administrators are going to be pleased with the fresh new look updated features. The most visible change is the new Interface. With a new look and streamlined access to the core features, the TSplus Version 12 Interface was designed with three main objectives in mind. Modern and User-Friendly Design: At once clean and functional, using modern design language to make management a breeze for administrators. Easy and Intuitive Navigation: Tabs are now displayed in a bar on the left side of the Administration Tool. The lexicon used is obvious and logical. Simplified Management: Features have been reorganized to present settings in a more logical way, making it easier for Administrators to configure a server quickly and simplify regular management operations – the most used features are more visible, the most used settings are pre-selected. Discover a Modern and Intuitive Admin Tool for Easy Remote Desktop Management! HOME: The homepage offers a real dashboard, displaying the most important information about the software and allowing quick actions on the server. It also includes an automatic audit of the local system to make sure everything is running normally as soon as the administrator starts the Admin Tool. APPLICATIONS: The Application tab is a new addition to the top level menu that creates a central management console for application publishing. With just a few clicks the administrator can publish a new application or manage his existing apps. PRINTER: The amazing Universal Printer feature finally gets the place it deserves! The TSplus Universal Printer makes it possible for users to print from within their published applications, using any device and any printer. With version 12, all of those great features are easier than ever to manage! WEB: Continuing toward the goal of simplifying administration tasks, the web tab has been redesigned. All web activity from the Web Portal with its free SSL certificate generator to management of the Remoteapp client has been consolidated into one easy to manage console. FARM: The Farm Manager is a special feature for TSplus Enterprise Edition administrators. In addition to all the great standard TSplus features, the Enterprise edition was designed with a special focus on scalability. The farm manager makes it easy to manage multiple servers in a larger enterprise infrastructure. SESSIONS: Session and User Management made easy. Administrators can easily manage user access levels, groups and session types all in one place. SYSTEM TOOLS: Direct access to basic Windows system administration tools in a snap. ADVANCED: Created for experienced IT Administrators, this tab offers a quick and easy way to add specific parameters and values directly to the TSplus program code. 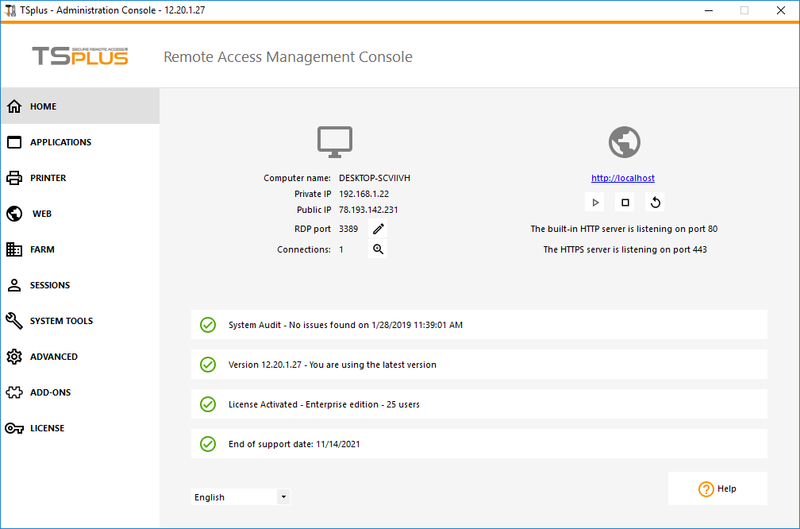 ADD-ONS: Administrators can integrate additional programs and benefit from the ultimate Remote Desktop Solution with RDS-Knight, Server Genius and the amazing new Two Factor Authentication tool! LICENSE: Allows administrators to quickly check on the status of their server’s license. As business grows and needs increase, the license manager includes a clear upgrade path to help keep resources scaled to needs. Following the path set out in 2018, TSplus’ Development Team gave its users one more fantastic feature to start the new year! Now, more than ever, Administrators have to be smart and creative to keep access to their data secure. Adding a Two Factor Authentication option to TSplus was the next logical step in its mission to provide safe online access to companies’ resources. As the bad guys get smarter and attack with better tools, passwords often aren’t enough to keep remote sessions secure anymore. One security code provided by something each user immediately has at hand: His Smartphone with an authenticator app such as Google Authenticate. Each time a user signs into a remote session via the Web Applications Portal he or she will need to enter a password and a code provided by the authenticator app on the mobile device. Further details about this exclusive new tool will be revealed soon! Stay tuned and sign in for the TSplus Newsletter. For more information, please see the Release Note.